To be technical, the term “Last step product” isn’t fully correct. It refers to the “Last Step”, but any detailer will tell you that there is no “Last” step. Detailing is a continues form of maintenance and repairing/undoing general wear and tear. This image show how the steps in a detailing process never end. If anything, the last step would probably be “maintenance”. 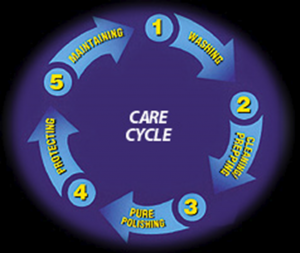 Which would mean that a LSP refers to the shampoo used to maintain the achieved finish and cleanliness. In other cases, the term LSP refers to the last product you use before you hand over the keys of the car to the owner. In some cases this means that the last product was a polish, and sometimes it can even be a shampoo or snowfoam. It all depends on the steps that where taken to give the customer what he paid for. The term LSP commonly refers to a protective product. This could be a wax, coating or sealant. Technically, a transparent plastic foil would also have protective properties, but it is not commonly referred to as a protective product, and thus not commonly referred to when people speak of a “LSP”. These last 2 items can be a LSP when a customer requests to not use a regular protective product because the paint is fresh or it has no need for a protective layer (showcars that aren’t driven, only displayed). There can also be a case in which somebody applies a glaze on top of a protective product. As has been explain in the paragraph above, even a shampoo can technically be a LSP.